In a meeting with the UN Under-Secretary-General and head of UN DESA, Liu Zhenmin, in Washington, D.C., this week, leaders of the World Bank Group (WBG) and the International Monetary Fund (IMF) committed to supporting UN DESA in this momentous year for sustainable development. The year 2019 is a critical milestone for our global goals to end poverty, fight climate change and ensure a more just world for everyone. Preparations are in full swing for this year’s marathon of crucial summits and events, including the September summit of the High-level Political Forum on Sustainable Development (HLPF) and the April ECOSOC Financing for Development Forum and SDG Investment Fair. 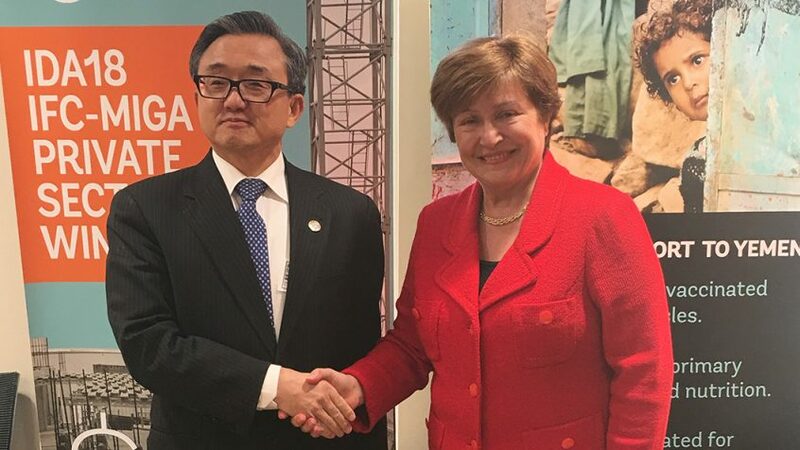 The Under-Secretary-General congratulated the World Bank Group for their recent announcements to increase climate financing and divest from fossil fuel projects as well as their continued support for countries around the world to achieve the Sustainable Development Goals (SDGs). Mr. Liu also praised the IMF for their efforts to prioritize the SDGs in their work with countries, which will help to ensure that all the global institutions speak in one voice when it comes to sustainable development. The Head of UN DESA welcomed the Fund’s leadership on SDG costing, gender and other issues. The Bretton Woods institutions, as the World Bank Group and the IMF are known, welcomed Mr. Liu’s visit to their Washington D.C. headquarters and pledged to support UN DESA in the preparations of the landmark 2019 events.